“We regret the United States’ decision to provide no further funding to UNRWA, which provides essential services to Palestine refugees and contributes to stability in the region,” Stéphane Dujarric, the spokesperson for the UN Secretary-General, said in a statement Friday. In the statement, Mr. Dujarric also noted that the US has traditionally been the largest single contributor to UNRWA and that the Organization appreciates its support over the years. The agency has expanded the donor base, raised considerable new funding, and explored new avenues of support, said Mr. Dujarric, noting also that UNRWA took extraordinary internal management measures to increase efficiencies and reduce costs. 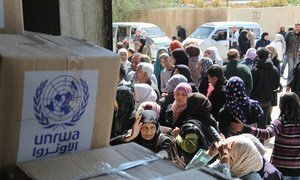 A pledging conference on Monday for the United Nations Relief and Works Agency for Palestine Refugees in the Near East (UNRWA) aimed to address the body’s chronic funding shortfall and also examine long-term priorities.